The Empress Effects Tape Delay Pedal gives you three different tape age effects, filter and modulation control and tap tempo delay control, all in a compact, maintenance free box. 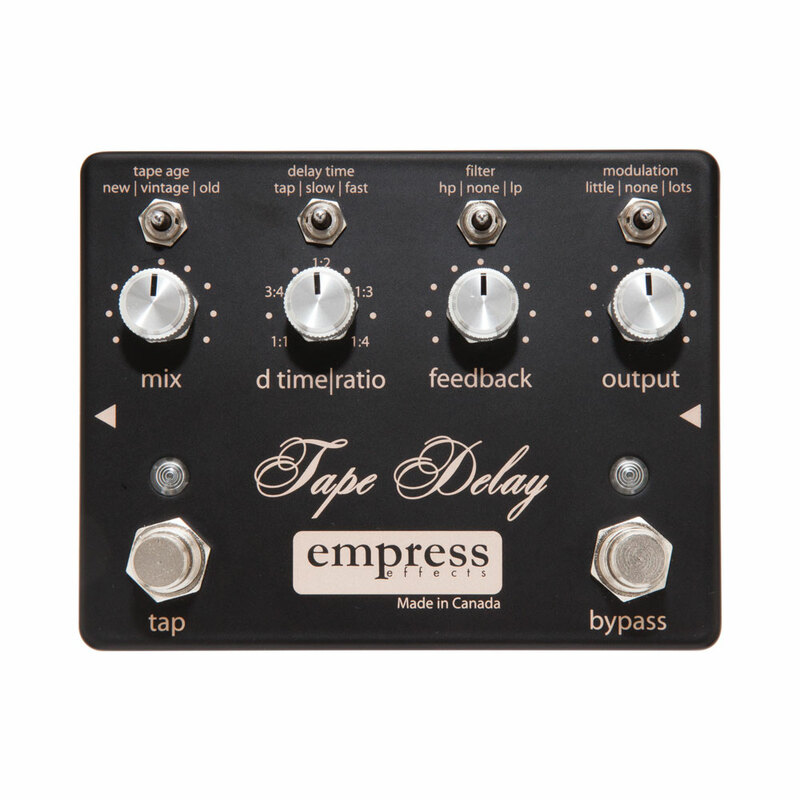 Empress Effects spent over 2 years perfecting tape delays, and now the results of their hard work are all shown in the stand alone Tape Delay pedal. You can switch between three different tape ages (new, vintage and old), new gives lush clean repeats, vintage adds wow and flutter giving the rich full bodied feel of a vintage machine and old has saturated warm, delay with lots of compression and dark, rolled off high end found with old tape and worn heads. Additional modulation can be added separately, switchable between none, a little (slower and subtle) and lots (faster, deeper modulation). Delay time is adjusted via the selector switch and d time/ratio knob to give a choice of delay times. When the switch is set to tap, the knob controls the ratio of the delay time relative to the tempo that is tapped on the footswitch (1:1 is the same speed, 3:4 is dotted eights, 1:2 is double the tapped speed, 1:3 is triplets and 1:4 is four times the tapped speed). When the switch is set to slow or fast, the knob controls the delay time from 2.8 seconds to 128 ms (slow) or from 256 ms to 5 ms (fast), when set to slow or fast the tap tempo footswitch clears the audio in the delay line (useful if you want to stop the delay from a chord being dissonant over the next chord played). The pedal also features an advanced configuration that lets you save up to 3 presets (replaces tap tempo delay option), switch between buffered and true bypass, choose between smooth or quickly changing delay times and inside the pedal there is also an internal switch that gives extra headroom when using the pedal with high output guitars. The Empress Effects Tape Delay Pedal sounds great out of the box but also gives a lot of options for tweaking to perfection.